Gel-clear Green Condensate drain strips are a natural solution using natures biocide. It is a purpose developed condensate drain strip for wall mounts, continuously releasing Tea Tree Oil molecules. Effective for 6 months, Gel-clear Green condensate drain strips are a natural approach to blocked condensate case drains. Preventing biofilm and foul odours from the drain pan. Gel-clear Green is safe and simple to use leaving a fresh, pleasant fragrance for its entire lifespan. Gel-clear Green is safe to use with condensate pumps. Prevents bioﬁlms that allow bacteria and odours to survive. Tea-tree oil (TTO) is the essential oil derived from a plant that has been used for hundreds of years, mainly for its antimicrobial properties. With the advent of ever-increasing resistance to antibiotics and biocides amongst organisms, TTO may play an important role in the ﬁght against resistance. The antimicrobial properties of TTO are well documented for applications such as disinfection and cleaning. The World Health Organisation presented an urgent call for new biocides and antibiotics in February 2017. The dire situation of resistant and resilient bacterial strains is a global threat. The development of new antimicrobials and antibiotics has waned within the last decades. Overuse and misuse are part of the antimicrobial resistance (AMR) problem, while sustainability remains unmet due to the demand of multiple mechanisms of action and proper broad-spectrum efﬁcacy. Gel-clear answers the call for new broad base efﬁcacy, non-synthetic anti microbial cleaning products. Gel-clear Green works as soon as it comes into contact with water by continuously releasing Tea Tree Oil molecules, to eradicate water borne pollutants, thereby preventing bacteria, mold and malodors from entering the ambient space. “Laboratory test shows that Gel-clear reduces water borne pollutants by at least 95%” Gel-clear Green is a natural solution using natures biocide. “Laboratory test shows that Eco-clear reduces water borne pollutants by at least 95%” Gel-clear Green is a natural solution using natures biocide. Gel-clear Green is a natural solution using natures biocide. It is a purpose developed condensate drain strip for wall mounts, continuously releasing Tea Tree Oil molecules. Effective for 6 months, Gel-clear Green condensate drain strips are a natural approach to blocked condensate case drains. Preventing bioﬁlm and foul odours from the drain pan. Using Gel-clear Green condensate drain strips could not be simpler! you simply place the tablet in the condensate pan………that’s it! The strip is designed to easily slide down the gap into the condensate tray. Place the strip in the condensate drain tray ensuring it is in contact with the water. Place the strip away from the drain outlet, one strip per case. It is recommended that strips are installed during maintenance visits, using Gel-clear Green keeps the unit clean and prevents odours, leaving a pleasant fresh fragrance. Gel-clear Green is safe for use with all condensate pumps, preventing bioﬁlm in the pump, the biggest cause of condensate pump failure. Once the strip has disappeared, the product is depleted. The strip will usually last for up to 6 months. Gel-clear Green strips are the user friendly, and environmentally friendly condensate drain treatment. The strip is 100% soluble, leaving no waxy residues. Suitable for all case types. Uses 100% natural Tea Tree Oil. Eliminates bioﬁlm that allows bacteria and odours to survive. Protects pumps from bioﬁlm, the biggest cause of early pump failure. Please contact office for SDS or download from www.cloned-gel.gel-clear.co.uk. 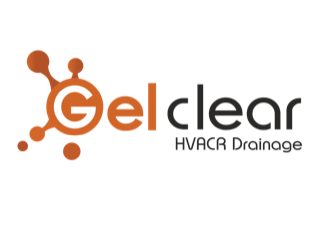 Gel-clear Ltd, 145 Bolton Rd, Darwen, Lancs, BB3 1DF.